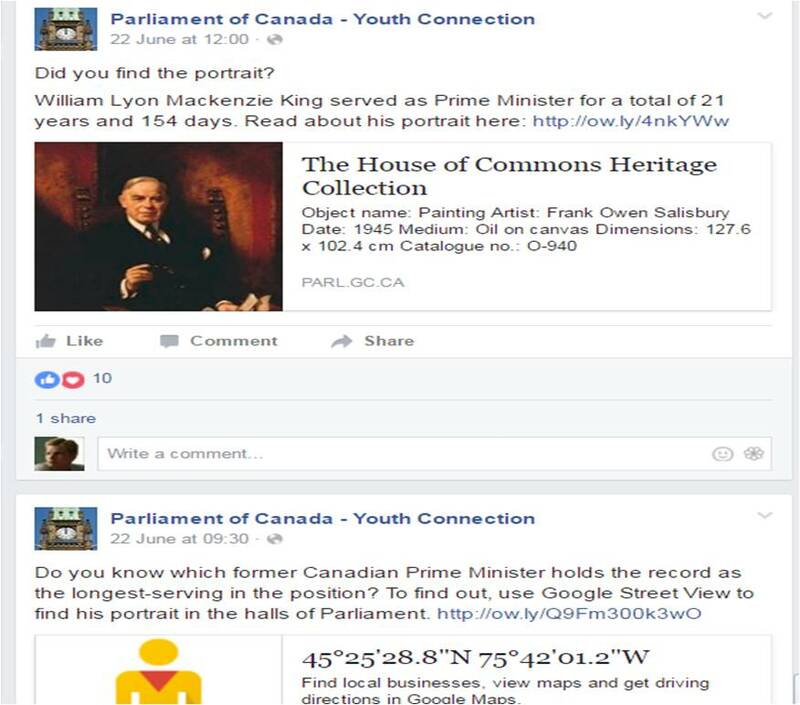 The Parliament of Canada — Youth Connection’s Facebook group asked on 22 June 2016, “Who is Canada’s longest-serving Prime Minister?” and asked users to submit their guesses before confirming the answer in a later post, as Mackenzie King. This question reminded me of an off-hand comment that I had included in my article in The Dorchester Review “1791: The Birth of Canada”, whereby 19th-century historian Alpheus Todd had placed the start of Sir John A. Macdonald’s premiership not in 1867 but in 1864. This in turn raises a broader question for this Canada Day (or Dominion Day, as it was once known), on which we celebrate the 149th anniversary of Confederation — not of “Canada” itself. So I would ask the question myself: “Who is Canada’s longest-serving prime minister?” The answer depends upon when you believe that “Canada” began. ‎If you dismiss the Upper Canada and Lower Canada (1791-1841) and the United Province of Canada (1841-1867) as irrelevant, then Mackenzie King would indeed fit the bill because he served a total of 21 years as prime minister over three non-consecutive ministries between 1921 and 1947. ‎The sesquicentennial of Confederation is now only one year away. Dismissing all Canadian history that took place before 1867 brings forth other powerful misconceptions, such as the view that 2017 marks the 150th anniversary of “Canada” instead of Confederation, which amended an existing polity but did not create a new one. The historical evidence suggests that you would be wrong to dismiss the other Canadas as irrelevant colonial baggage unworthy of celebration or commemoration. The facts are clear and ought to speak for themselves; since they do not, I shall lend my voice to them in this article. “Canada” as a polity dates back to 1791, not 1867. From 1791 to 1931, first Upper and Lower Canada, then the United Province of Canada, and finally, the Dominion of Canada, were a colony of the Imperial Crown and subject to the jurisdiction of the Westminster Parliament. In other words, Upper Canada and Lower Canada, established by the Westminster Parliament through the Constitutional Act, 1791, are the direct predecessors of the United Province of Canada, which was established by the Westminster Parliament through the Act of Union, 1840 and is in turn the direct predecessor of the Dominion of Canada, which the Westminster Parliament established through the British North America Act, 1867. In contrast, the provinces of Nova Scotia and New Brunswick are the successor polities of the Crown colonies of Nova Scotia and New Brunswick, which, unlike the Canadas, were established by the prerogative authority of the Imperial Crown rather than by statutory authority through the Westminster Parliament. The closest 20th-century equivalent in international law that best describes the relation between these successor Crown colonies would be the concept of “continuator” or “continuing state.” And in other respects, Canada became a successor state to the United Kingdom post-1931 once the Crown of Canada emerged as a separate legal person from the Crown of the United Kingdom and gave Canada its own separate international legal personality. Section 45 (XLV) of the Act of Union, 1840 states that the executive authority, and any instrument promulgated under it, of Upper Canada and Lower Canada shall remain in full force and effect under the United Province of Canada. […] all Powers, Authorities, and Functions which […] are vested in or are authorized or required to be exercised by the respective Governors or Lieutenant Governors of the said Provinces […] shall […] be vested in and may be exercised by the Governor of the Province of Canada […]. Section 46 (XLVI) states the same for legislative authority and the body of law in effect for the Canadas shall carry over to the United Province of Canada intact. The British North America Act then codifies the principle of continuity in several other areas. Section 122 states: “The Customs and Excise Laws of each Province shall, subject to the Provisions of this Act, continue in force until altered by the Parliament of Canada.” Section 129 provides for the “continuance of existing laws, courts, officers, etc.” in Ontario, Quebec, Nova Scotia, and New Brunswick. Except as otherwise provided by this Act, all Laws in force in Canada, Nova Scotia, or New Brunswick at the Union, and all Courts of Civil and Criminal Jurisdiction, and all legal Commissions, Powers, and Authorities, and all Officers, Judicial, Administrative, and Ministerial, existing therein at the Union, shall continue in Ontario, Quebec, Nova Scotia, and New Brunswick respectively, as if the Union had not been made […]. Section 130 pertains to “the transfer of officers to Canada” and meant that any public officer-holder in New Brunswick or Nova Scotia whose duties would, after Confederation, fall under the jurisdiction of the Dominion of Canada, pursuant to section 91, be transferred from the provincial civil service to the Dominion civil service. Section 139 mandated that any proclamation made under the Great Seal of the Province of Canada that was scheduled to enter into force after 1 July 1867 would still enter into force but would apply instead to either the Dominion of Canada (“that Province”), the new Province of Ontario (“Upper Canada”) or to the new Province of Quebec (“Lower Canada”). The executive and legislative institutions of the United Province of Canada carried over into the Dominion of Canada: the Governor General, Prime Minister, civil service, militia, parliament buildings, and Legislative Council of the United Province of Canada became the Governor General, Prime Minister, civil service, militia, parliament buildings, and Senate of the Dominion of Canada on 1 July 1867. In practice, this direct continuation of executive authority meant that Governor General Monck and Prime Minister Macdonald transitioned seamlessly from the United Province of Canada to the Dominion of Canada. Macdonald became prime minister of the Dominion of Canada on 1 July 1867, but the first general federal election did not take place until September 1867. Since the United Province of Canada and the Dominion of Canada were a colony of the Imperial Crown, the ultimate source of executive authority — Queen Victoria — remained intact, which in turn allowed the authority delegated to the Governor General, exercised on the advice of the Prime Minister and Cabinet, to remain intact. The militia and the civil service themselves also carried over. For example, the Geological Survey of Canada was established in 1842 and, as its website says, is celebrating its 175th anniversary in 2017 just as we mark the sesquicentennial of Confederation that same year. The Decennial Census prescribed under section 51(1) of the Constitution Act, 1867 first occurred in 1871 for the Dominion of Canada as a whole because the last decennial census for the United Province of Canada had taken place in 1861. Furthermore, the Canada Gazette‘s — the official publisher of the Government of Canada — extends back not to 1867, but rather to 1841. The capital of the Province of Canada simply became the capital of the Dominion of Canada, and the edifices on Parliament Hill themselves similarly made the switch, as did the Library of Parliament. The Legislative Councillors from Ontario and Quebec also became the first batch of Senators for Ontario and Quebec. According to ParlInfo, several of the Legislative Councillors from the United Province of Canada were appointed en masse, by proclamation, as the first Senators representing Ontario and Ontario in the 1st Parliament – which is ironic, given that many of them were originally elected as Legislative Councillors representing Canada West and Canada East! The text of the British North America Act, 1867 leaves no doubt that the Dominion of Canada is the successor state or continuator of the United Province of Canada, just as the text of the Act of Union, 1840 states plainly that the United Province of Canada is the continuator of Upper Canada and Lower Canada. It is an incontrovertible fact. Some of the constitutional conventions that defined the United Province of Canada merit further explanation here, because, unlike the legal framework and executive and legislative authorities of the polity, they did not survive the transition to the Dominion of Canada. A political culture of consociationalism and elite accommodation between equivalent English- and French-speaking political parties developed in the United Province of Canada and even went so far as to produce a de facto co-premiership, with one English-speaker and one French-speaker heading each Ministry; however, only one of the two formally headed each Ministry as Premier, with the other serving as Deputy Premier. It seems that the tenure of the premier – not the deputy premier, and not the premier and deputy premier jointly – determined the life of the ministry. This virtual co-premiership emerged as the executive counterpart of the legislative Double Majority Convention, whereby the assembly could pass bills only with majorities of MPs from Canada West and Canada East. The Double Majority Convention itself derived from the sectional equality of representation between Canada West and Canada East, irrespective of population. Between 1841 and 1854, Canada West and Canada East each returned 42 MPs, for an Assembly of 84 MPs; from 1854 to 1867, the Assembly expanded to a total of 130 MPs, with 65 each from Canada West and Canada East. Confederation, federalism, and the principle of representation by population replaced consociationalism and sectional equality and thus rendered both the Double Majority Convention and the co-premiership moot. Both died out immediately upon Confederation. Sir John A. Macdonald edges out Mackenzie King as the longest-serving prime minister because what 20th-century historians have defined as his last term as prime minister of the United Province of Canada (1864-1867) blends in seamlessly with his first term as prime minister of the Dominion of Canada (1867-1873). Alpheus Todd – the renowned 19th-century parliamentary scholar who is, crucially, a contemporary of all of these events – also defines Macdonald’s term in office as 1864-1873, not 1867-1873. Macdonald of course went on to serve another term from 1878-1891. In this account, Todd wasn’t even counting Macdonald’s two earlier terms as prime minister before 1864; he also served in this capacity from 1857 to 1862, apart from 4 hilarious days in August 1858 that surrounded the Double Shuffle Incident. Sir John A. Macdonald is the longest-serving first minister of the Crown in Canadian history, having served in that capacity for 22 non-consecutive years (with the 1864 baseline) and nearly 27 years with the 1857 baseline, either of which surpasses Mackenzie King’s non-consecutive tenure of 21 years. Janet Ajzenstat, “Celebrating 1791: Two Hundred Years of Representative Government,” Canadian Parliamentary Review (Spring 1991): 26. Gary Caldwell, “The Quebec Assembly,” The Dorchester Review 6, no.1 (Spring-Summer 2016): 44. James Crawford, The Creation of States in International Law (Oxford: Clarendon Press, 2006), 667-672. Christopher Moore, 1867: How the Fathers Made a Deal (Christopher Moore Editorial Limited, 1997). Suzanne Langevin (ed), La Procédure parlementaire du Québec, 3e édition (Québec: Assemblé national, 2012), 25. Alpheus Todd, Parliamentary Government in the British Colonies, 2nd Edition (London: Longmans, Green, and Co., 1894), 62-63. In that case, Todd used 1864, and not 1867, as his point of reference, since 1891 minus 27 years is 1864. Macdonald served as Deputy Premier from 24 May 1856 to 26 November 1857. This entry was posted in Constitution (Written), History of British North America. Bookmark the permalink.